Go east (left) on Hyde Park Boulevard. 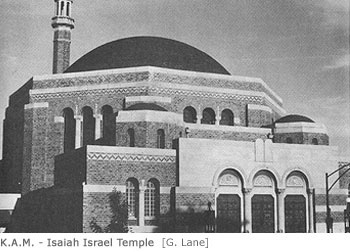 On the northeast corner of Hyde Park and Greenwood stands an imposing Byzantine structure, a synagogue designed by Alfred Alschuler and built in 1923-24 for the Isaiah Israel congregation. In 1971 K.A.M. merged with Isaiah Israel and moved its services to this magnificent place of worship. The building's smoke stack is designed to look like a minaret. Both the synagogue and its neighbor to the south, the Chicago College of Osteopathic Medicine and Medical Center, have provided important anchors for this part of the South Lakefront. The above photograph shows the K.A.M.-Isaiah Israel Temple at the northeast corner of Greenwood and Hyde Park Boulevard in 1980. Continue one block east on Hyde Park Boulevard to Woodlawn (1200 East) and turn left (north). Just north of the intersection on the east side of the street is a private driveway, turn right into Madison Park. This private park and development, which lies between Hyde Park Boulevard and 50th Street, between Woodlawn and Dorchester, is isolated from the rest of the neighborhood. The small strip of green grass with trees along it is lined on both sides with closely adjoining homes and apartment buildings. Among these are the award-winning Y.C. Wong atrium townhouses. The old Madison Park Hotel on the northwest corner of Dorchester and Hyde Park Boulevard is being renovated as an apartment complex.